• Leave a legacy for future generations. Gifts of Stock - A gift of stock entitles you to a tax deduction for the market value of the donated stock. If the stock you wish to donate has been held for more than one year, you can avoid capital gains tax on any appreciation of the stock by donating the stock prior to the sale. *Residual Bequest - You designate all or a portion of your remaining estate to the Army after other beneficiaries (including debts, taxes and other expenses) have been paid. *Contingent Bequest - You designate all or a portion of your estate to the Army only if a named beneficiary predeceases you. * Please consult with us to be sure that your bequest language is properly worded so that it will benefit The Salvation Army as you choose. Gifts of Life Insurance - You may no longer need life insurance that was purchased years ago to provide for children or other family members. When an existing policy is given to us, you can deduct, as a charitable contribution, the current value of the policy (or the net cost of the policy if this is less than current value). Of course, future premium payments are also deductible after ownership has been transferred to charity. Retirement Plans - If left to your heirs (other than your spouse), these assets are subject to both income and estate taxes resulting in as much as 75% of these assets going to the IRS. Therefore, this is an excellent asset to use for charitable giving to reduce the tax-burden. Your retirement account can also be transferred to us to set up a Life Income Plan that pays a lifetime income to a family member, with later benefit to The Army. Charitable Gift Annuity - In exchange for your gift of cash, appreciated securities or a combination of both, we agree to pay you (and/or the life of your chosen beneficiary) a fixed amount annually for your lifetime. You receive an immediate income tax deduction, spread out any capital gains tax liability, and often increase your spendable income. Charitable Remainder Trusts - You transfer assets to a trust that pays you and/or beneficiaries selected by you for life or a period of up to 20 years. You receive an immediate income tax deduction. Payments can be a fixed dollar amount or variable to be based on the annual value of the trust. At the end of the trust, the remaining assets are transferred to the Army. Gifts of Real Estate or Other Property - If you gift us property that you have owned for longer than one year, capital gains taxes can be completely avoided and the full fair market value of the property is generally deductible. But, perhaps you prefer to continue living in your home? A retained life estate makes this possible. By giving the Army a remainder interest in your property, you, or a person you designate, are permitted lifetime use of your home. 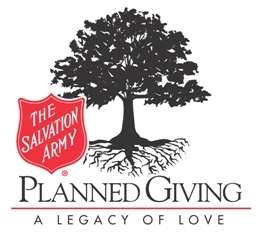 Upon the death of the designated person, ownership transfers to The Salvation Army of Harrisburg, PA. A charitable deduction is allowed in the year the remainder interest is established and because the property is transferred to the Army, estate taxes are avoided. A gift in any of the above listed ways can mean a new beginning for many families and individuals...a promise of eternal Hope to all those in need.